Did you think there would be more on the list? The fact that I value words doesn’t mean that I have to overuse them. Don’t you value when someone gets to the point? 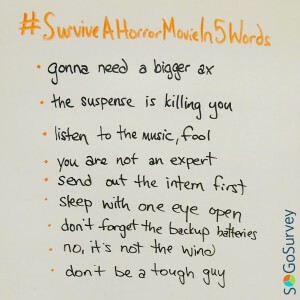 On Friday, my colleague saw that #SurviveAHorrorMovieIn5Words was trending. Naturally, she brought it to my attention immediately. The challenge did, in fact, have my name all over it. It’s fair to say the list got a little carried away. Not me – the list. You can take a peek at part of our list here and on our Instagram. What’s so great about having a limit that is, admittedly, arbitrarily imposed? It’s a challenge. Do what you came to do and get out. Be clear, be clever, be done. 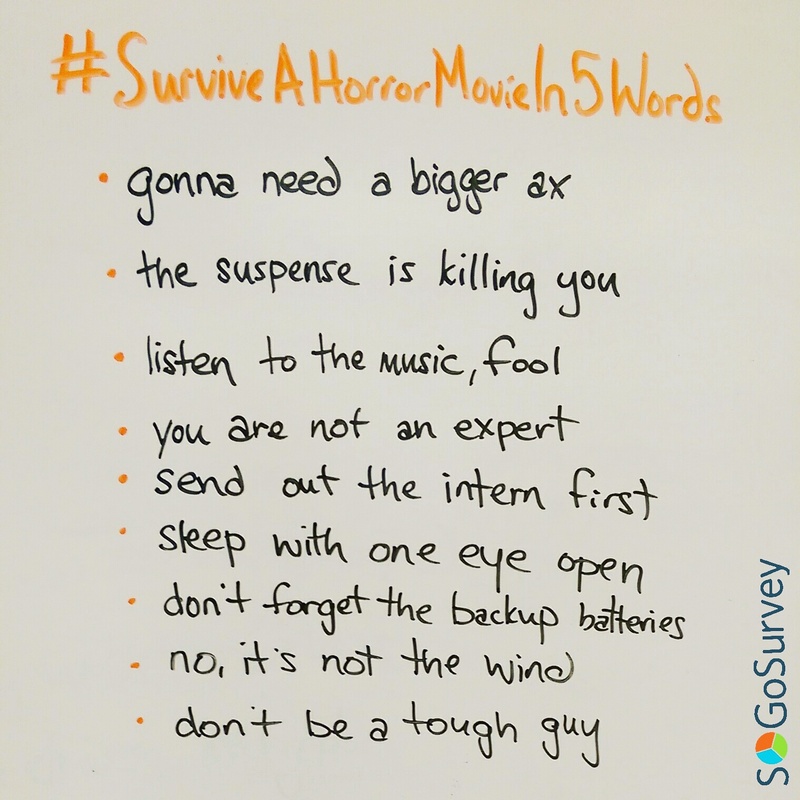 Other than haiku and our Halloween webinar about scary movie cliches, what popped up in my head was the recent Twitter decision to pilot doubling the character count for tweets. If you missed it, Twitter’s launched 280-character limits for certain users for testing and exploration. I work at a tech company. I understand that testing matters. But come on. What about Twitter usage today suggests that more is better? Double the bad behavior, double the advertising? Halloween or not, there’s some scary stuff out there. If you’ve ever launched a survey and given a giant text box with a nearly limitless character count, you’ll know what I mean. A good question can help [Share your favorite Halloween joke! vs. Anything else? ], but simply leaving enough space to mess around in can inspire some unexpected behavior. I once reviewed results of a survey in which a student had used a particularly generously sized text box to write out the lyrics of the Narwahl Song. (If you’re not familiar with this particular piece, YouTube offers both 1:09 and 10:01:20 versions – that’s just over a minute and just over ten hours. Exactly.) You might not be surprised to know that this addition didn’t offer much insight to the survey administrators. What’s the point? Stick to the point. Whether it’s using your own words or asking for someone else’s, make the space work for you – and your #hashtags, of course.